Such a ban would be combined with another component: a five-cent fee on paper bags. ALBANY — New York would become the third state to ban single-use plastic bags — like those handed out at grocery and convenience stores — under a deal lawmakers have all but finalized, multiple sources said Thursday. The ban would be combined with another component: a five-cent fee on paper bags. But it would be up to counties and cities to “opt in” to imposing the nickel fee, leaving discretion up to local politicians, officials said. That aspect could reduce the impact of the ban/fee and push consumers into using paper bags more often, some disappointed lawmakers and environmentalists said. The ban is expected to be included as part of a roughly $175 billion state budget agreement lawmakers are hoping to finalize by Monday, the beginning of New York’s fiscal year, officials said. 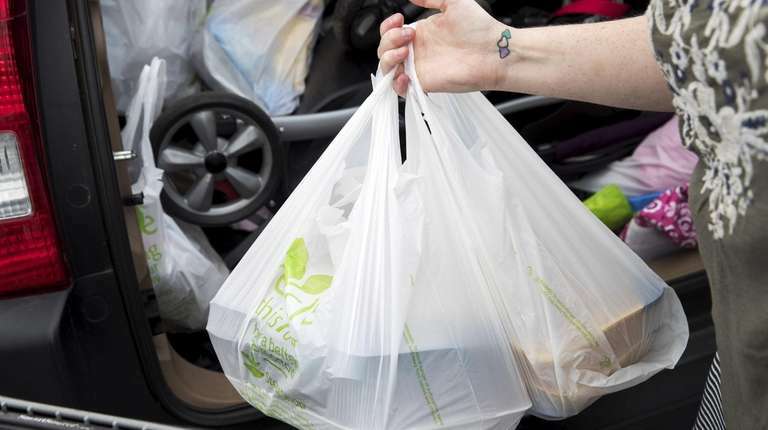 A final version of the bag legislation could include some exemptions, such as for food deliveries, food storage bags, newspaper bags and trash bags. Participants in the state’s food stamps and “Women, Infants, Children” program for low-income households would be exempt from the five-cent fee. Also, the new state legislation would pre-empt any previously enacted local laws on plastic and paper bags — effectively rescinding, for example, Suffolk County’s five-cent fee on both types of bags, a state official said. The county, then, would have to reaffirm its fee on paper bags, perhaps through an administrative process. About 25 counties and municipalities in New York have enacted some type of ban or fee on plastic and paper bags, according to Riverkeeper, an environmental group. New York would be following California and Hawaii in banning plastic bags. Some groups hailed it as huge step forward, saying New York was “joining a global movement” toward prohibiting single-use plastic items. The European Union, earlier this week, voted to ban plastic consumer items such as plates, cutlery and straws as of 2021, to help clean up oceans. Assemb. Steven Englebright (D-Setauket), chairman of the Assembly Environmental Committee, said plastic bags “impose a very high cost on the environment,” especially to marine animals such as whales and turtles who mistake items for food. He added the ban wouldn’t become effective until March 2020 to allow merchants transition time. Some environmentalists, though, said the paper-bag fee should have been made mandatory or, at minimum, structured to make counties “opt out” rather than “opt in” to charging a fee. The proceeds from the nickel would be split: 3 cents for the state Environmental Protection Fund, 2 cents for the local government imposing it, state officials said.